Approximately 24 springs are at the headwaters of this river, producing 400 to 500 million gallons of water per day. The river is designated a National Natural Landmark and an Outstanding Florida Water. I find out how the river was named when paddling the river. This flowing body of water truly does possess rather vibrant colors. It is a gorgeous river. 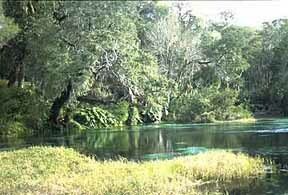 In 1999, I kayak from the KP Hole upstream to the main spring within Rainbow River State Park. There, we snorkel in crystal clear water for a while, then paddle downstream, where I was able to do a relaxing and visually impressive "snorkel drift dive" by letting the current take me downstream for a number of miles. I see several large fish. We also spot otter, large turtles and a number of wading birds. Our take-out downstream from KP hole gives us a pleasant 3-4 hour paddle.